4783 412Z 8 Pfg. 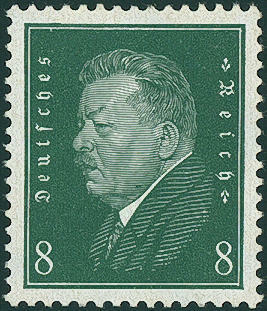 Presidents of the Reich, scarce green gum, in perfect condition mint never hinged, expertized Peschl BPP. Michel 360,- €. 4784 ✉ 413 10 Pfg. 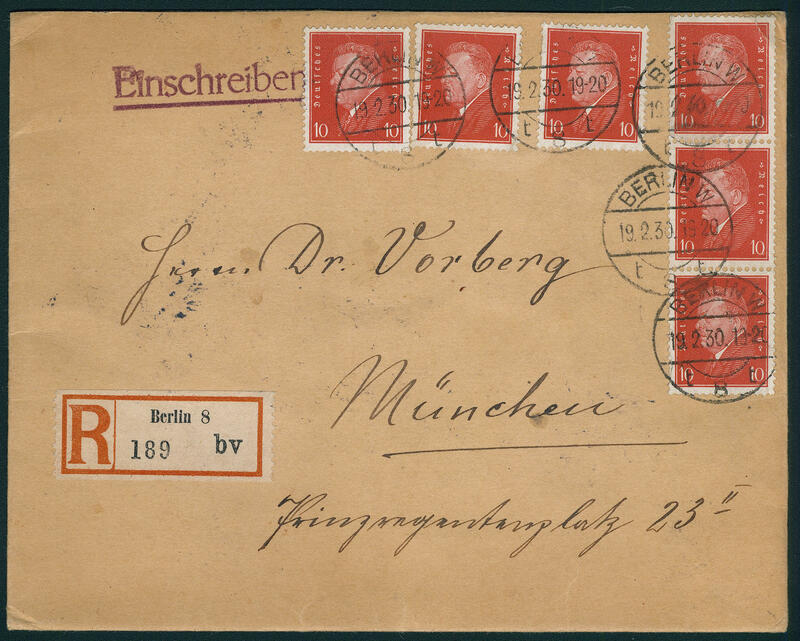 Presidents of the Reich, interesting mass multiple franking from six copies, a value right above corner crease and small tear, on decorative registered cover from \"BERLIN 19.2.30\" to Munich with arrival postmark. 4785 ✉ 421 60 Pfg. 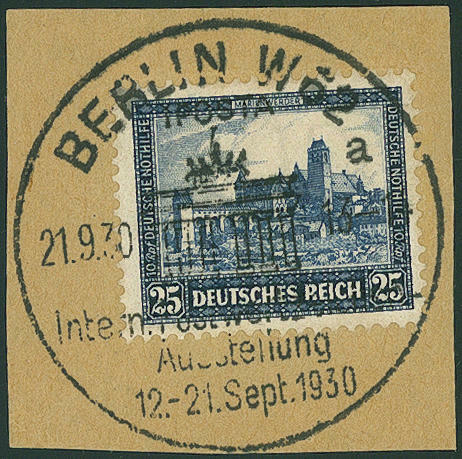 Presidents of the Reich, scarce mass multiple franking from 14 copies, partly scissors separation, through it mostly a perforation row missing, all stamps with Perfin on air mail letter to buenos Aires / Argentina, slight traces of usage. 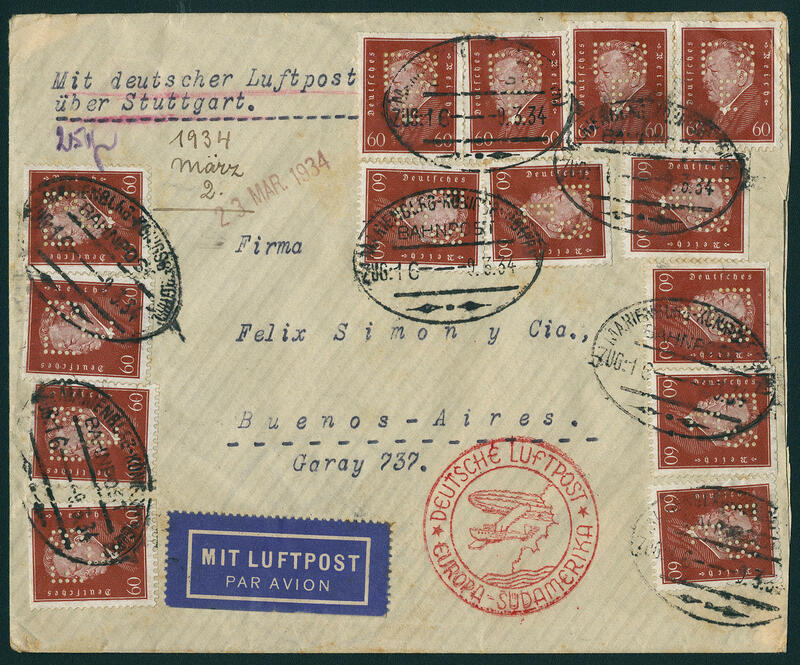 An especially impressive and extremely scarce franking! 4786 ✉ 422 80 Pfg. 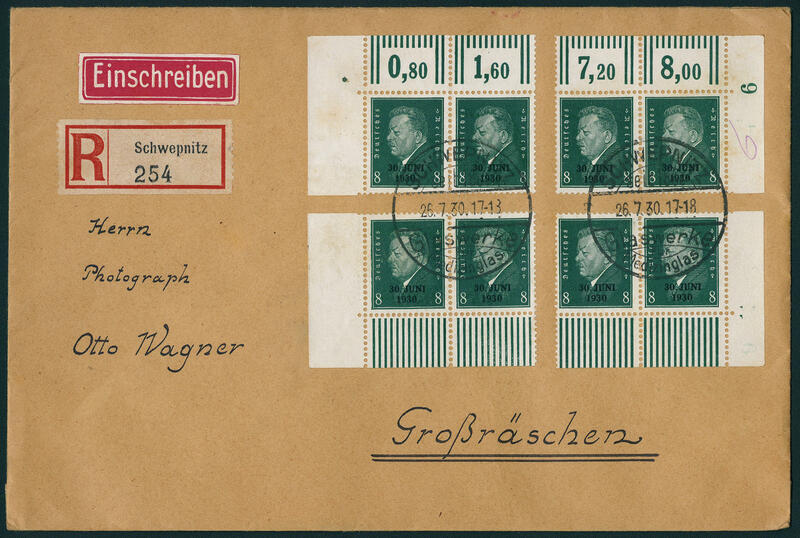 Presidents of the Reich, scarce mass multiple franking from five copies, to the margin fixed, right upper stamp defect, also airmail postcard from \"FRIEDRICHSHAFEN 13.11.30. \" with red special confirmation stamp \"1. 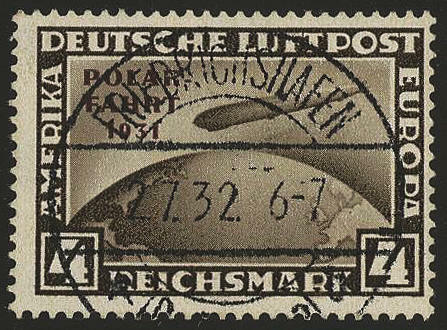 Overseas flight of the DORNIER flight ship DO X Europe-America\" with on board cancellation mark, as well Brazilian transit cancellation to Philadelphia. Rare! 4787 ⊙ 434I 50 Pfg. 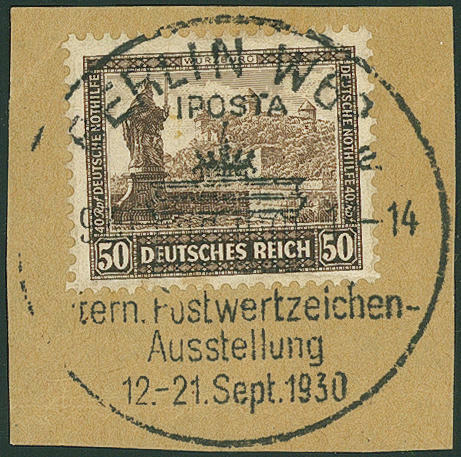 Help in need 1929 with plate flaw \"40 PE in lieu of PF\", neat cancelled \"BERLIN\". This plate flaw comes only on field 34 in a part of issue before. Slightly increases twice signed Schlegel BPP. Michel 500,- €. 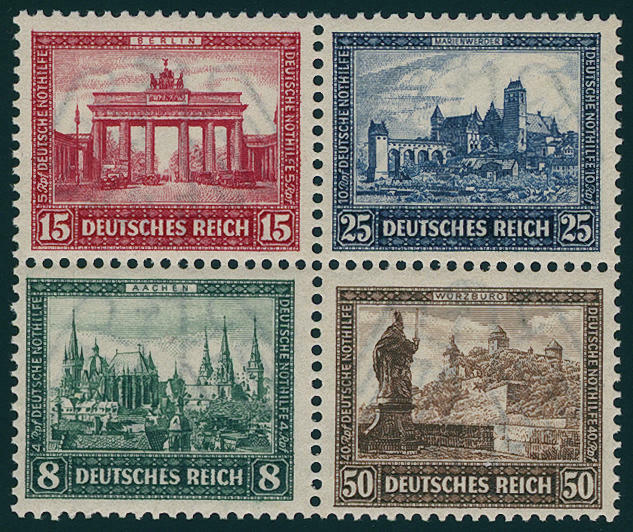 4788 435/37 Presidents of the Reich 1930, in perfect condition mint never hinged, without any signs. Michel 180,- €. 4789 ⊙ 438,456 4 RM. South America flight and 4 RM. 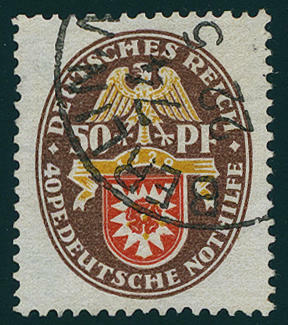 Polar travel, both values centric cancellation, stamps and overprints genuine, stamp faked, accordingly expertized Schlegel BPP. Favorable space filler! 4790 ✉ 444 8 Pfg. Deduction of allied occupation troops from the Rhineland, all fours possible horizontal corner margin pairs as wonderful pure mass multiple franking on very nice, almost correctly franked registered cover with enclosed receipt for delivery from \"SCHWEPNITZ 26.7.30. 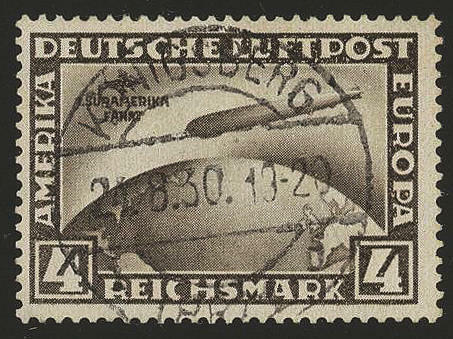 \" to Large ashes with arrival postmark. As well the right upper pair with plate number \"6\". An all extraordinary, in this kind possibly unique document! 4791 ✉ 444 8 Pfg. 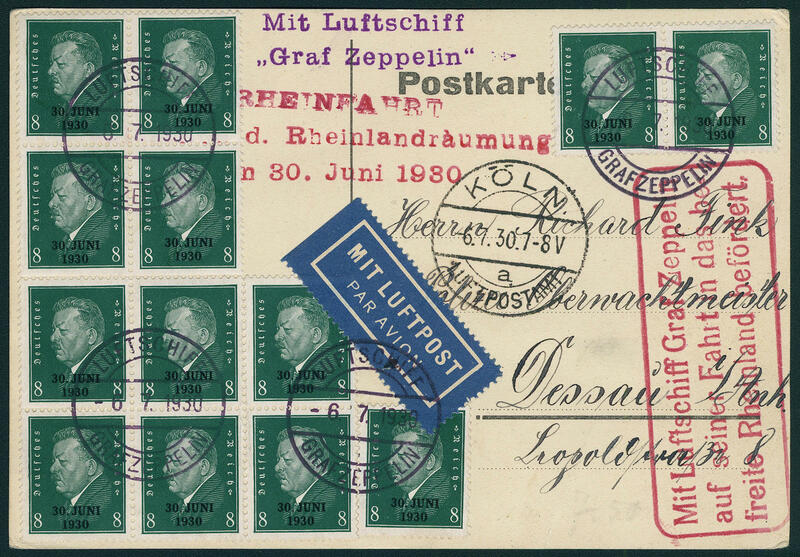 Deduction of allied occupation troops from the Rhineland 1930, very nice mass multiple franking from 13 copies on Zeppelin postcard with on board cancellation mark \"airship Count Zeppelin 6.7.1930\" to Dessau with red special confirmation stamp. Very decorative and rare! 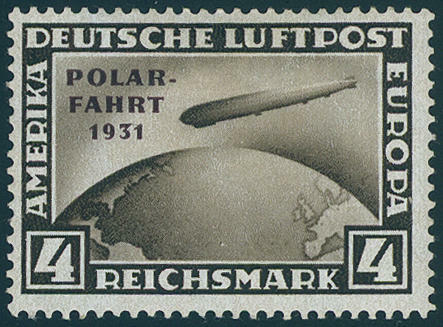 4792 446/49 International Postage Stamp Exhibition 1930, center piece from the souvenir sheet, fresh colors and in perfect condition mint never hinged Michel 440,- €. 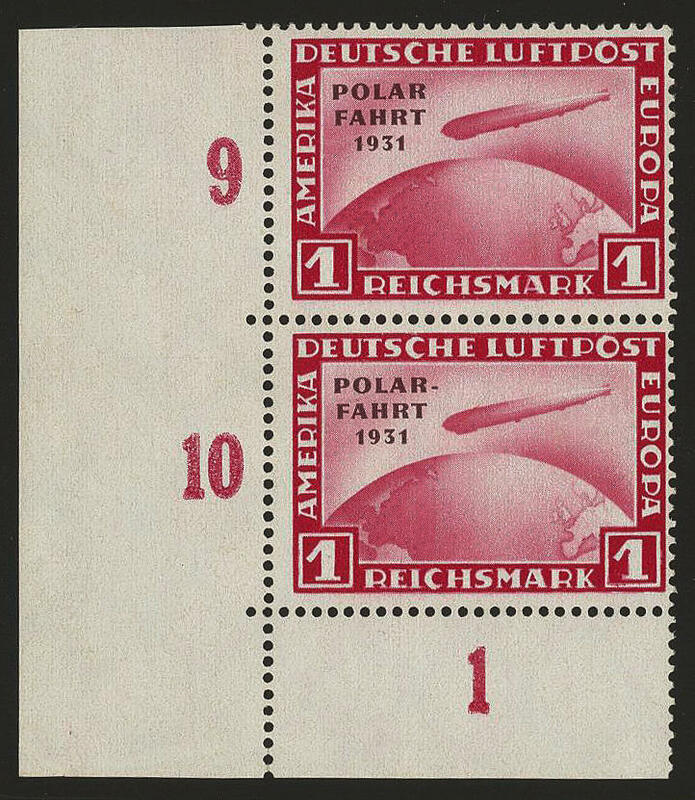 4793 ∆ 446/49 International Postage Stamp Exhibition 1930, all fours souvenir sheet stamps on lovely letter pieces with centered special cancellation \"BERLIN 21.9.30. \". In this kind with centered cancellations extraordinarily rare! Michel 560,- €. 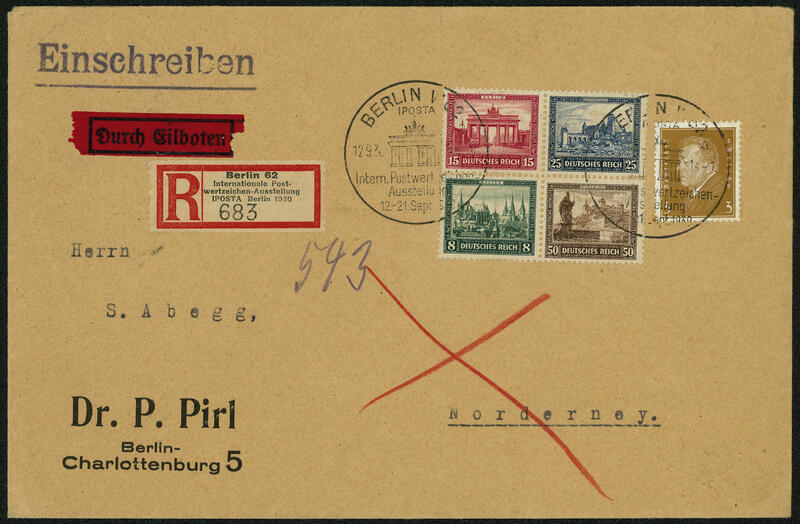 4794 FDC 446/49 International Postage Stamp Exhibition center piece on decorative, very scarce registered First Day Cover with first day special cancel \"BERLIN 12.9.30\" to Bergedorf with arrival postmark, expertized Schlegel BPP. Michel for souvenir sheet 3000,- €. 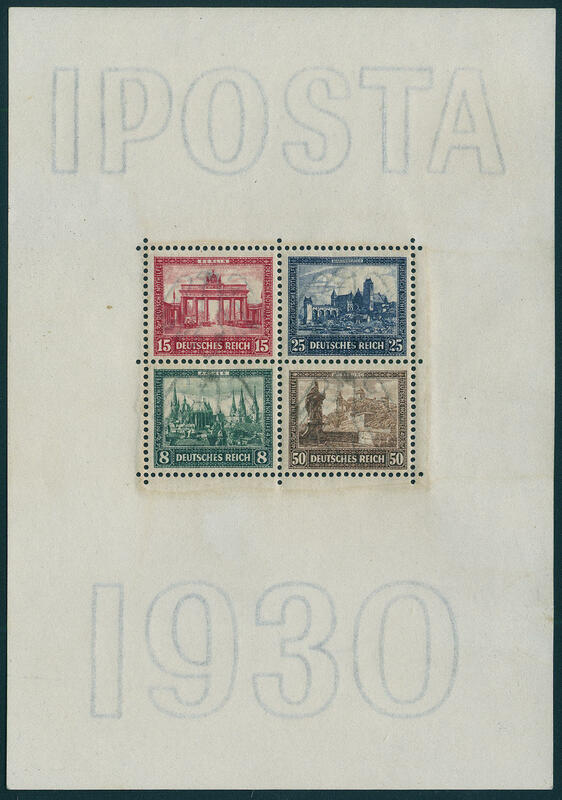 4795 FDC 446/49 International Postage Stamp Exhibition 1930, center piece from souvenir sheet with additional franking 3 Pfg. 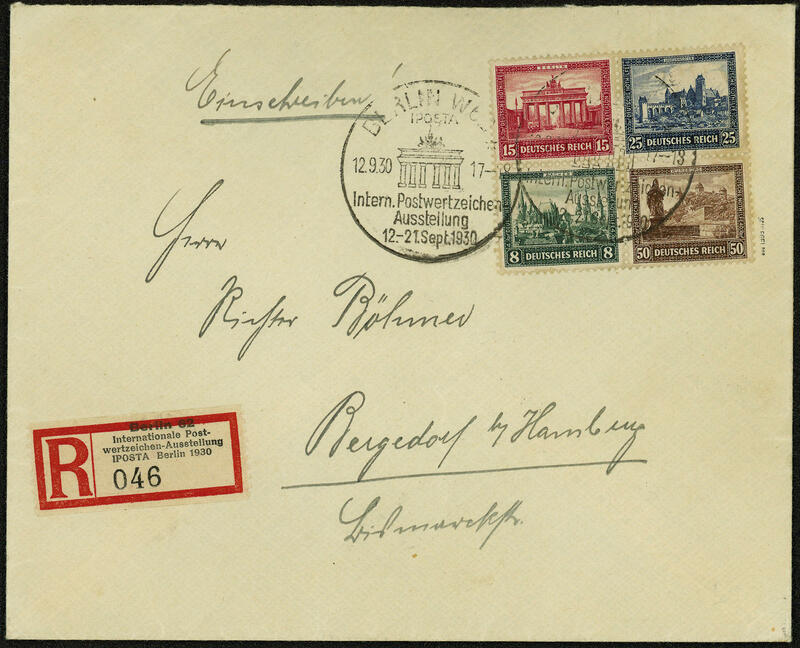 On faultless, nearly correctly franked registered special delivery First Day Cover from \"BERLIN 12.9.30\" to Norderney with arrival postmark. First-Day-Covers of this issue are very rare! Photo expertize Schlegel BPP. Michel for souvenir sheet 3000,- €. 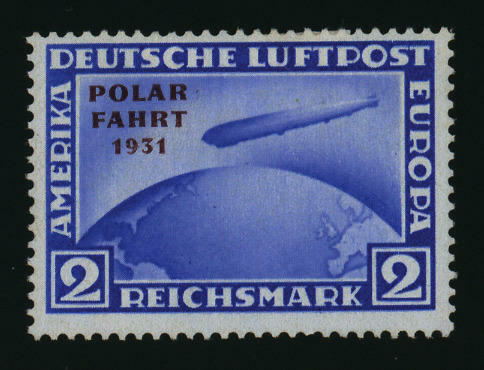 4796 446/58 Polar travel 1931, fresh colors and in perfect condition unused. Michel 900,- €. 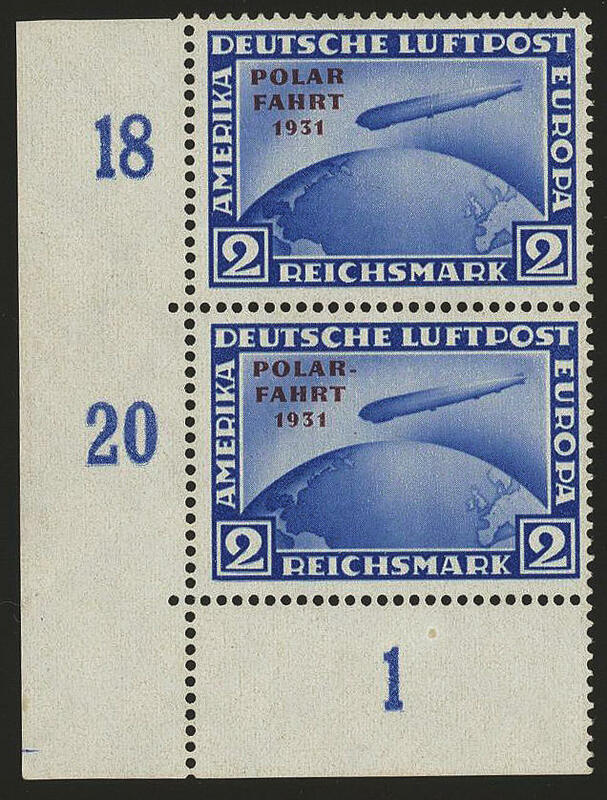 4797 Bl.1 International Postage Stamp Exhibition souvenir sheet 1930, fresh colors and in perfect condition unused, expertized Schlegel BPP. Michel 500,- €. 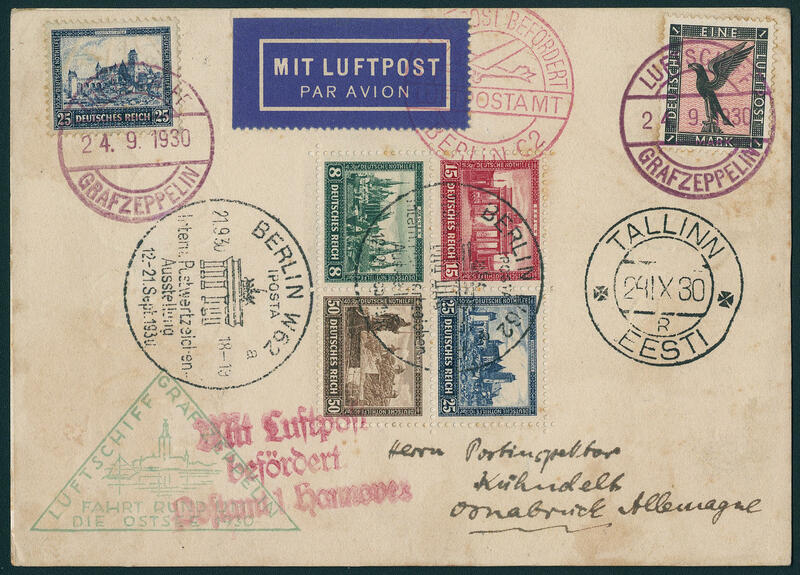 4798 ✉ Bl.1 International Postage Stamp Exhibition souvenir sheet 1930 with additional franking on decorative Zeppelin postcard, slight traces, to the East voyage 1930 with special cancellation \"BERLIN 21.9.30\" and on board cancellation mark \"airship Count Zeppelin 24.9.30\" to Osnabrueck, all postmarks. 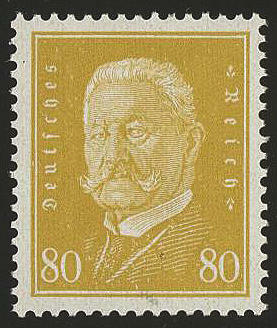 International Postage Stamp Exhibition souvenir sheets are on Zeppelin documents extraordinarily rare! 4799 ✉ 450/53 Help in need 1930, two sets with additional franking 4 Pfg. 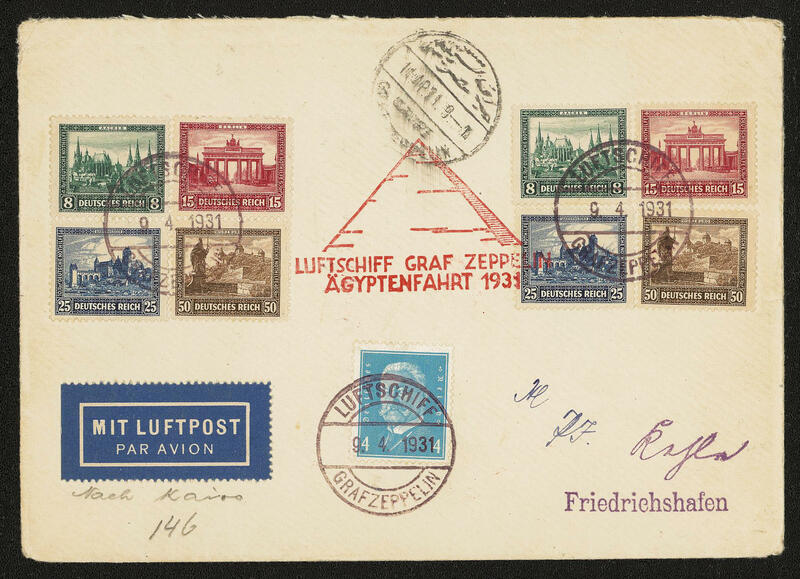 On decorative Zeppelin cover to the Egypt trip 1931 with on board cancellation mark \"airship Count Zeppelin 9.4.1931\" and red special confirmation stamp to Cairo with arrival postmark and then to Wiesbaden transported. 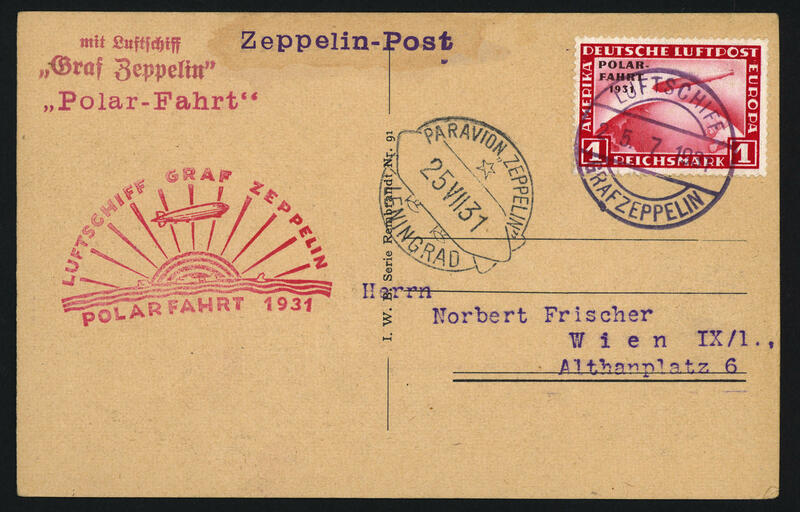 A very decorative Zeppelin cover with an extraordinary franking! 4800 ✉ 456 1 RM. 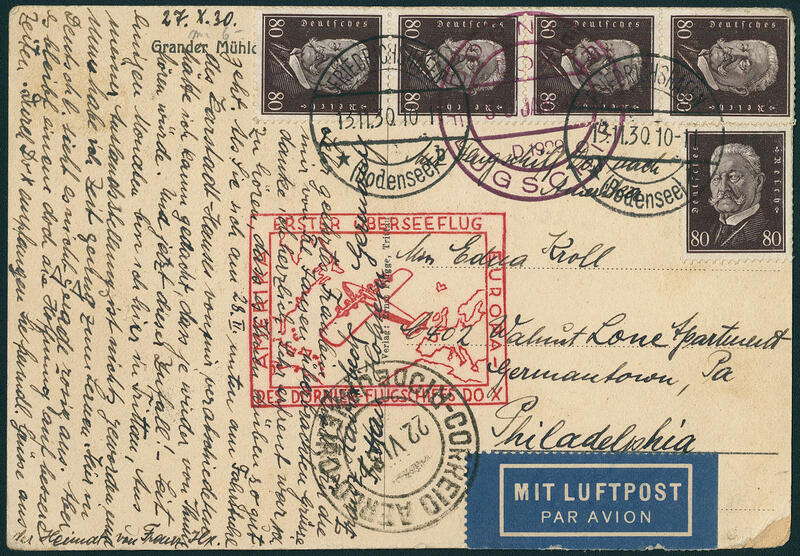 Polar travel with interesting, recurring printing error \"Strichlein before trip left\" on Zeppelin postcard to the Polar travel 1931 with on board cancellation mark to Vienna. An extraordinary piece! Photo expertize Aisslinger BPP. 4802 456/57I 1-2 RM. 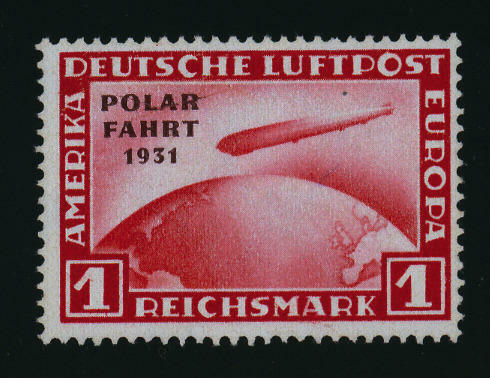 Polar travel 1931, both values with scarce overprint error \"unhyphenated to polar\", fresh colors and very well perforated, in perfect condition unused, signed Köhler. Michel 1300,- €.